Using the musical language and context of the revolutionary musical Dramas by Cavalieri, Caccini, and Monteverdi, the piece tells the story of Joseph and his brethren – one of the most touching stories of the old testament. The piece was composed especially for ensemble Profeti della Quinta, and is set for five voices, instruments, and basso-continuo. The text is taken directly from the book of Genesis in its original Hebrew (subtitles in various languages are available). The piece stresses the implications of taking early music a step further: not only to bring music from the past to the present day, but by acquiring lost skills of music making and attempting to understand the spirit of the time, to create new work of art. As written in the preface to Emilio de Cavalieri's Rappresentatione di Anima e di Corpo (1600, Rome), the aim of music is to move the feelings of the listeners: "mercy and happiness, crying and laughter" (à pieta e à giubilo; à pianto e à riso"). The Rappresentatione di Giuseppe e i suoi Fratelli follows this ideal, and aims to move the affects of the listeners, even the doubtful ones. 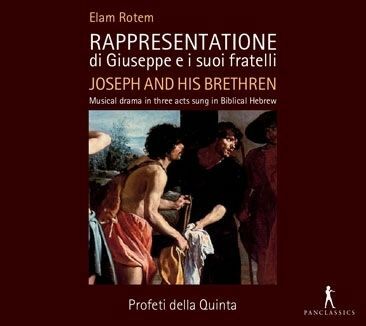 "A very special example of ‘New early music’ is the Rappersentatione di Giuseppe e i suoi fratelli by Elam Rotem… he has achieved a remarkable thing. This work is not a mere stylistic copy: Rotem has created, with means of early 17th century music, a thoroughly original work which is worth listening to. It is an enrichment of the Repertoire... Both from a musical and dramatic perspective it is definitely worthwhile to have the work performed in concert halls, so that people interested in ancient music will get to know it. The work is portrayed with great power of persuasion." "In their new CD, the vocal ensemble 'Profeti della Quinta' present a dramatic, path-breaking work, which transcends historical and geographical boundaries. 'Joseph and his Brethren' is both a precious relic of the past and a new, innovative opera."